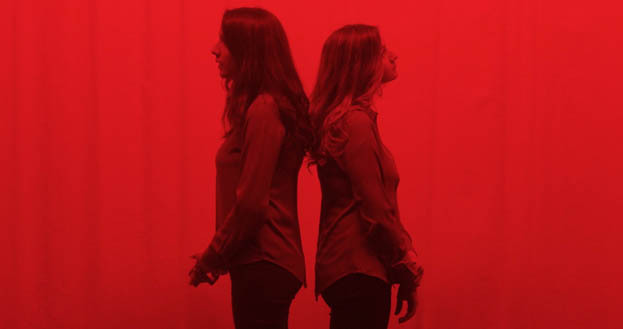 A Second Self is an experimental, collaborative film project by Moea Creugnet and Maureen Monod, who were brought together through a shared interest in the notion of duality. Creugnet and Monod examine the double not only as a theme, but also as a process, resulting in an extensive investigation of issues of authorship and individuality. The direction of such a creative process has led the two to reinvent themselves as a duo; at times taking on the role of sisters, at others that of a couple. By embracing each other's vision of duality, they become both subject and object, challenging the dichotomy between fiction and reality. The film takes the form of a scenic essay where the narrative and the visual output are both deeply intertwined, following the example of the French New Wave and Beckett's absurd theatre. The lines between the authentic and the performed, between the genuine and the performed are blurred, as a third person, a third entity arises – MOMAU– a transfiguration of each character into two lookalikes, yet still similar. Transition is running a programme of curated screenings and talks during A Second Self. The gallery is open from 2.30pm and talks start at 4pm on Sunday 6 & 13 and the gallery opens at 2pm with the talk starting at 4.30pm on 20 December. Refreshments will be served. The conversation will examine the relationship between the duo and the process of their collaboration followed by a screening of an extract from Persona (Ingmar Bergman, 1969). A talk by Mark Aerial Waller followed by a Q&A. Waller will show extracts from his 12 episode work Time Together (2012-2013) commissioned by the Baltic triennial as a daily broadcast. Waller’s process of working takes its roots from the French director and ethnographer Jean Rouch where the 'radical fabulation' provides a relation between the authentic ethnographical image and the inauthenticity of cinema. Screening of Opening Night (Cassavetes, 1977) from 2pm and Garageland editor Cathy Lomax in conversation with Alex Michon at 4.30pm. There will be a free copy of the magazine for the first 15 visitors to the event.